The dreary weather could not dampen the holiday spirit in the Borough of Bath. On Sunday, December 2, borough residents and elected officials came out to Monocacy Creek Park to kick off the holiday season with the borough’s annual Christmas tree lighting. 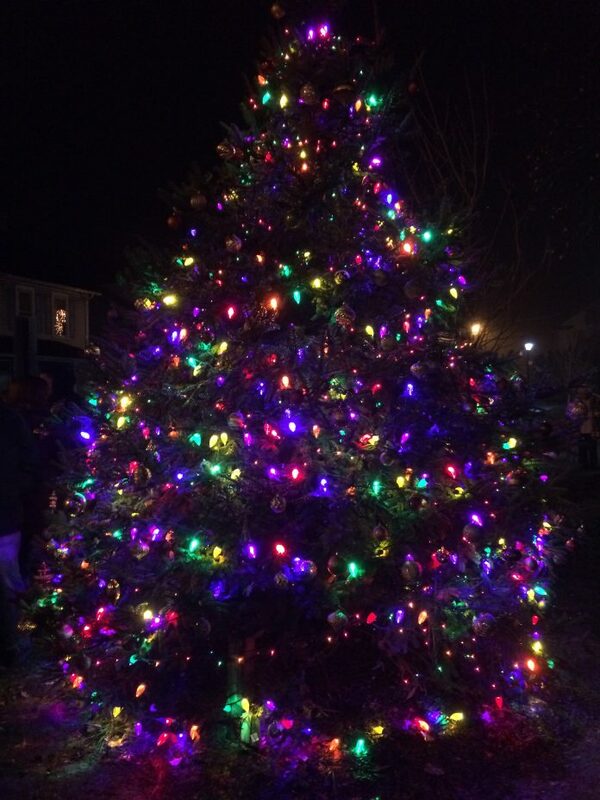 The tree, donated by Unangst Tree Farm in 2014 and decorated by the Bath Lions Club, was lit by Robert Fields, a lifelong resident of Bath who served as president of the Bath Borough Council, was on the Colonial Regional Police Department Commission, and was instrumental in erecting the symbolic clock in the borough’s center. He is a resident, said Mayor Fiorella Mirabito, who has gone above and beyond for the community. “I know he holds Bath in his heart,” she told the crowd. “I never thought of living anywhere else,” added Fields before lighting the tree. Council President Mark Saginario also spoke. He called 2018 a year of accomplishments that all residents should be proud of. The Bath Community Choir, under the direction of Sharon Schrantz, performed several numbers to get the crowd in the holiday spirit, including “The Christmas Waltz” and “Rockin’ Around the Christmas Tree.” Everyone was welcome to join in during a candlelight performance of “Silent Night.” Meanwhile, resident Scott Henninger performed the National Anthem. The tree was blessed by Father Christopher Butera of Sacred Heart of Jesus Parish Church. “May the light [the tree] shines…be a sign of joy in the borough,” he said. An opening prayer was given by Reverend Michael Eckroth of Christ UCC. Following the tree lighting, special appearances were made by Princess Belle, Buddy the Elf, and Santa Clause. Hot chocolate and cookies were handed out by Cub Pack 33. The night was made possible due to the generous donations and time of numerous borough volunteers, including the Bath Lions Club, Greater Bath Area Chamber of Commerce, Mr. and Mrs. Barry Fenstermaker for donating candy canes, the Bath Borough Council, the Bath Volunteer Fire Department, Marjorie Rehrig for donating candles, Mrs. Araujo from Learn-N-Play Daycare for donating children’s books, and Bobby Siegfried for helping with the evening’s sound system. The dazzling tree will shine brightly in Monocacy Creek Park through the holidays.